Kane's Handcrafted Donuts has the ultimate Father’s Day treat!!! Kane’s Handcrafted Donuts and Sons of Liberty Spirits have come together to create the ultimate Father’s Day treat. No, it’s not another tie or power tool, it’s a Whiskey Glazed Donut! This year, give dad something that won’t get lost at the bottom of a closet -- a dozen whiskey donuts won’t last long enough for that. This bad boy will be available at both Kane’s locations beginning Wednesday, June 1st1st through Thursday, June 30th. The whiskey glaze is created using Sons of Liberty Spirits’ international award winning Battle Cry Whiskey, an American Single Malt born from a Belgian-style ale. Battle Cry is a unique experience from beginning to end - hints of dark fruit and spices, such as anise and black licorice, with a subtle sweetness and a lasting finish that leaves the palate begging for more. Kane’s boiled down the Battle Cry to cook out most of the alcohol and then blended it with sugar, local organic honey and butter to craft a divine whiskey glaze fit for a king, like dad! 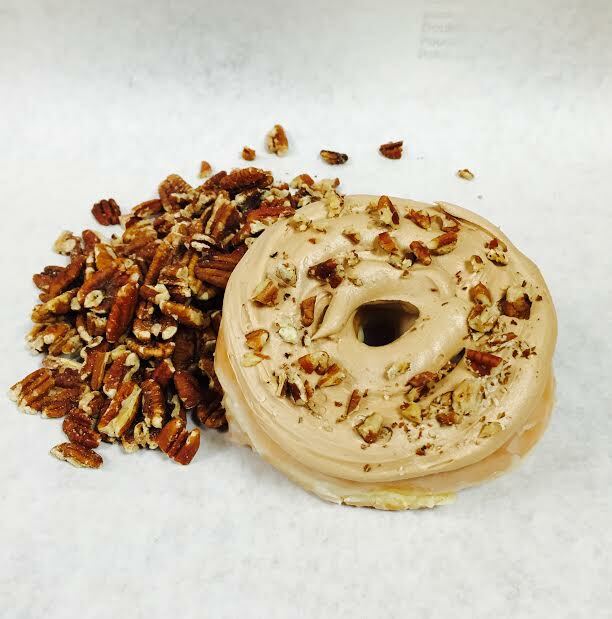 Since this donut is too good to only serve for one weekend, they’ve made it one of their June flavors of the month! In addition to the Battle Cry Whiskey Glazed Donut, Kane’s is also featuring two other flavors of the month, a Devil’s Food Chocolate Sea Salted Caramel Donut and a Butter Pecan Donut. Located in Boston’s financial district on the corner of Oliver and High Street inside International Place, Kane’s Handcrafted is the first expansion of the 61-year-old, world-famous Kane’s Donuts in Saugus. Kane’s Handcrafted Donuts are made hours before you eat them with locally milled flour, local farm-fresh eggs, organic honey from a local beekeeper, fresh fruit, real bacon, high-quality chocolate, fresh spices, and more.For more information, please visit www.kanesdonuts.com. The Sons of Liberty (www.solspirits.com) believe that being American means taking a stand without compromise and fearlessly pursuing your dreams no matter what stands in your way. Sons of Liberty Spirits was founded to revolutionize and redefine American Spirits, and they are doing so using a beer into spirit methodology. Challenging century old traditions, Sons of Liberty produces two American Single Malt Whiskies born from distinctly flavorful beers (UPRISING and BATTLE CRY) and the first-ever seasonal line of whiskies (Sons of Liberty Seasonals). Proving their passion has now bounds, the whiskies are accompanied by True Born Gin – Belgian Wheat Act, a Genever Style Gin distilled from a Belgian Wheat Beer. The Sons of Liberty distillery is located in South Kingstown, Rhode Island and their products are distributed throughout Rhode Island, Massachusetts and Connecticut. Please visitwww.solspirits.com/where-to-buy to find locations carrying Sons of Liberty products.